« Swimming Principle #2: Most of what we “know” about swimming is wrong! The primary reason the average swimmer converts only 3 percent of energy into forward motion is that our swimming actions are so strongly influenced by basic self-preservation instincts. Concerns about choking and sinking are so primal that they continue to affect how we swim long after we’ve lost our conscious fear and even after we’ve become quite accomplished. What else could explain why Sun Yang lifts and cranes his head, noticeably twisting?his body even while setting a 1500-meter world record. Though this ungainly moment passes so quickly that you probably wouldn’t notice it on the surface, he repeated this several hundred times during his 1500m world record. How much time might it have cost him to distort his bodyline over and over? Why does he still do that? It’s most likely this habit began to form when he was still a new swimmer, perhaps 6 years old. Eventually he hid it well enough that his coaches overlooked it. But if a world record holder can still waste energy in such an obvious way, how likely is it for the rest of us to avoid doing so? My most recent post Most of What You ‘Know’ about Swimming is Wrong! explained how most of the advice we receive about swimming is likely to reinforce our existing wasteful instincts. We’re less likely to critically examine questionable advice when it agrees with what our own instincts already incline us toward. 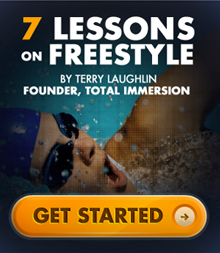 The converse of this is: Actions that can significantly improve your swimming are most likely counterintuitive. As examples, consider five common myths and their non-instinctive counterpoints. Myth: To swim fast, you must ride high on the water. This myth arose because elite sprinters seem to have more of the body out of the water. In fact, hydroplaning occurs only at speeds of 30mph or greater, while no human has ever swum faster than 5mph. What we’re actually seeing is the swimmer cutting a deeper bow wave. This requires so much energy that it’s almost impossible to sustain for more than a minute. Fact: On average, a human body, rides 95 below the surface. 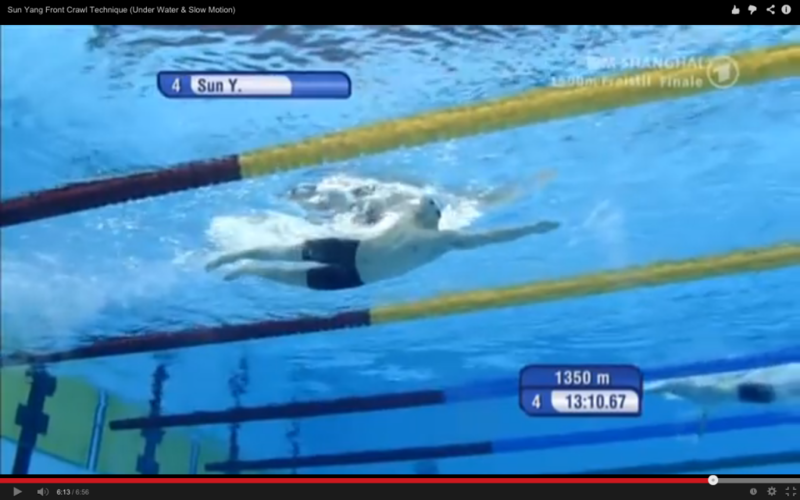 (How much of Sun Yang’s body is below the surface in the picture above ? As he swims 1500m faster than anyone in history!) We?swim through, not over, the water. Consequently drag avoidance, not power production, is our most important strategy for swimming faster. Myth: Keep the water at your hairline. Partially due to influence from TI, this formerly universal notion is finally changing. Why did coaches teach this for so long? They said it would . . . help you ride higher on the water. In fact, the opposite is true. Fact: The head represents about 8 percent of body mass. So if most of it is above the surface, other body parts must sink. This causes us to kick more, greatly increasing drag and energy waste. Because the head has many cavities, it is quite buoyant. Focus on feeling that your head rests on a ‘cushion’ of water and aligns with your spine —a universal principle of good biomechanics, demonstrated by Katie Ledecky at the World Championships in Kazan Russia.? Myth: Push water back (past your thigh . . . and/or faster in the last third of your stroke.) Various versions of this encourage you to focus on pushing back—whether farther, harder, or faster. For the vast majority of swimmers these actions create far more turbulence than propulsion. They also make you tired because they put the workload on?using arm and shoulder muscles, rather than tapping core power. Fact 1: The most important contribution of the hand and arm is to reduce drag. To accomplish this, focus on using your arms to extend your bodyline and separate the molecules in front of you, rather than on pushing on the molecules behind you. This reduces wave drag–the most significant limiter of Stroke Length and speed. Fact 2: When focused on?propulsion, use your hand to hold your place, instead of to push water back. The world’s best swimmers move the body past the hand. (In fact when Doc Counsilman filmed Mark Spitz in 1968, he was astonished to see that Spitz’s hand exited the water ahead of where it went in.) They can do this because they (i) excel at ‘active streamlining;’ and (ii) apply pressure with great precision–but surprisingly little force–as shown by a study of 1992 Olympic swimmers. Myth: Kick to keep your legs from sinking. Kick even more to swim faster. Because of our survival instinct to churn the arms and legs, we need little encouragement to overdo this. Nonetheless we hear advice from all sides to kick more and harder. From the swim instructor who hands us a kickboard at our first lesson, to coaches who believe no workout is complete without a set devoted to pushing a kickboard up and down the pool, there’s a universal mania for kicking. Fact: The legs are awesome at burning energy and creating drag, but almost pathetic at creating propulsion. Doc Counsilman (again) studied the effects of kicking among elite swimmers in the 1960s and found that kicking increased drag, and contributed nothing to propulsion at?speeds above 5 feet per second—a thoroughly pedestrian pace for top swimmers. Like the arms, your legs make their greatest contribution by?drafting behind the upper torso. Unless your goal is to sprint a short distance, you can hardly go wrong by kicking less. You’ll not only reduce drag and save energy. You also allow your legs to be drive more by core-body action than by fatigue-prone thigh muscles. Myth: Stroke faster to swim faster. Like each of these myths, I subscribed to this as a young swimmer and it took me more than a decade—from age 38 to about 50–to fully undo the habit. We churn the arms from our first lap. Instinct also seems to suggest that the ‘obvious’ way to swim faster is to stroke faster. 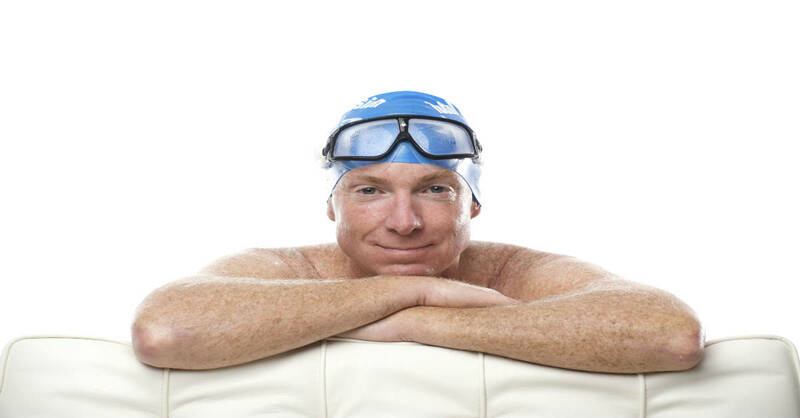 Then there are seemingly authoritative voices who tell us that top triathletes or open water swimmers stroke 70 or more times per minute and therefore we should too. Fact: Swimming speed is determined by a simple equation: Stroke Length times Stroke Rate equals Velocity (SL x SR = V). You need both to swim faster but SL has conclusively been shown to be the foundation–the measure that correlates most strongly with performance. To swim faster, first establish your optimal SL (measured by strokes per length or SPL and indexed to your height). Reducing drag is the easiest way to do so. Then incrementally increase SR, while maintaining an efficient SL. The most precise and controllable way is by using a Tempo Trainer, increasing tempo by as little as one-hundredth of a second to ease adaptation. Increase tempo a tiny bit; maintain your stroke count. When that feels natural and easy, make another tiny tempo increase. Before long the cumulative increase in speed—with a long, relaxed, efficient stroke—will be quite significant. And sustainable. As each of these stroke thoughts/skills are counter-intuitive, remember that habit, instinct—and most influences you encounter—will pull you back toward wasteful actions. Making these changes permanent requires conscious, purposeful, and mindful practice. Find more tips like this in the Ultra-Efficient Freestyle Handbook, a richly-illustrated, easy-to-read 140 page guide to understanding freestyle technique in depth. 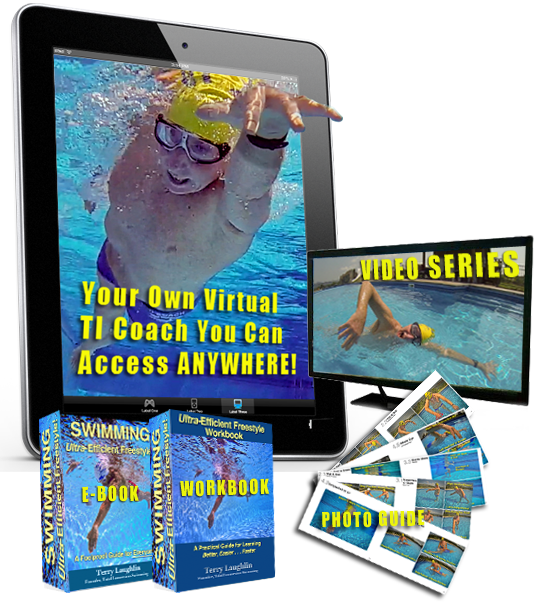 It comes, along with 15 downloadable videos and a learning and practice workbook in our Self-Coaching Toolkit. Great article. Takes some courage to point out technique mistakes of Olympic champions. The one thing I wonder about, though, is what about newer studies? Doc Counsilman did studies back at the 60’s. Has no one conducted newer studies? Surely advances in swimming speeds cannot only be attributed to improved conditioning, right? Swimmers must also be training more smartly. That would be a great blog post – giving an overview of current common wisdom amongst elite coaches and how the average swimmer can also benefit from it. Also, some of it is probably inapplicable to your average swimmer. That would also be useful to know. For instance, I’ve read that kicking is also less beneficial to us normals because we simply don’t have the same ankle flexibility as elite swimmers do. You ask an excellent question and raise a topic for the swim community to ponder. It seems as if Doc Counsilman was a one-off and we’ve not seen anyone like him come along since. He coached at the very top level, producing countless WR holders, winning six NCAA team championships, and acting as head coach for the U.S. Olympic Team multiple times. At the same time, he was a top researcher–indeed THE leading swimming researcher of his time, motivated by a thoroughly curious mind. As both coach and researcher, his investigations were tremendously pertinent and of great practical value as a source of clarity and how-to-coach guidance for other coaches. Researchers who are not coaches fall far short of this, too often producing studies of interest mostly to other researchers, but of limited practical value to coaches. Since then people have done one or the other. No one has done both at Doc’s level of accomplishment and seriousness. However, though the studies I referred to were done nearly 50 years ago, they remain entirely applicable today as they address fundamental and unchanging principles of the fluid dynamics affecting a human body. Nice blog!! Thanks for clearing the things which most people thought was true. These facts can be very useful for us. Even i am a good swimmer so its better to know these things if you are into it. I have been reading some of your blogs recently, and have noticed that you get a lot of encouragement and almost none critical questions or comments. I wonder why that is. My best guess is that the critical comments are not getting through the moderation. Do you have any documentation for this, or is it something you think may be correct? In another blog you have confirmed this myth yourself. 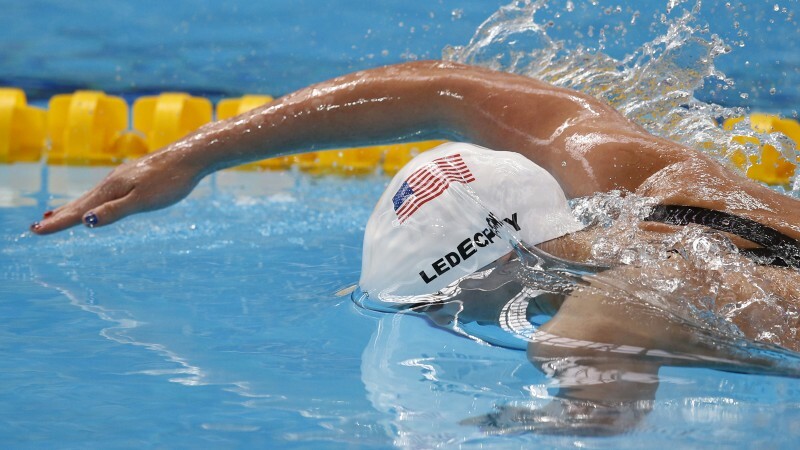 In your blog “Want to swim like Katie Ledecky? You can!” you confirm that she is using more strokes on each lap at her 200 than her 1500 m freestyle. She is also swimming faster, thus using less time to accomplish each stroke. Doesn’t that mean she strokes faster on the 200 m? I leave the math to you. Again, thank you for reading and commenting. However, again, you missed the main point. ALL swimmers stroke faster at the end of a race. I’m sure that all eight swimmers in that 200m freestyle used their highest Stroke Rate on the final 50. However, only one of them–Katie Ledecky–took the gold medal. And Ledecky did two things that are quite uncommon. 1) She had a longer stroke–relative to height–than the other finalists. 2) She did a better job than the other finalists of maintaining her superior Stroke Length as she also increased Stroke Rate. And thus her Stroke Rate was undoubtedly lower than that of those she left behind. I thought this particular blog was about 5 myths, that in your opinion was wrong. When you say faster, I take that as a higher speed. Like Ledecky did when swimming 200 m with a faster stroke rate and higher speed then on her 1500 m.
I really don’t see which main point I missed here. Ledecky is obviously a good swimmer, but I wouldn’t call her stroke length superior. Have you considered how far she was kicking? I guess that is of some importance. And she was kicking further then her rivals, earning a stroke or two on every lap. With 0.16 seconds on a 200m. In a complex sport like swimming, I would be very careful to draw any conclusions from that. The comments section of the blog isn’t the ideal place for a lengthy discussion of fine points. The TI Forum is far better suited for that and allows for the participation of many more people in the dialogue. So I invite you to start a thread on Stroke Length v Stroke Rate in creating Velocity. I imagine you’d find many people interested and a lively discussion would probably result. It’s not that higher stroke rates play NO role in higher speeds, it’s that swimming faster is dependent on many SKILLS. Maintaining a long stroke–as you stroke faster–is a rare, exacting and invaluable skill. The vast majority of those who turn over faster generate little additional speed–and pay an unsustainable price in oxygen consumption when they do. Most create more commotion (turbulence) than locomotion and quickly run out of gas. Excessive turnover–and the acidosis that results–is one of the primary reasons that even or negative splits are so rare. That’s my point . . . and Katie Ledecky is indeed a fantastic exemplar of that. I’m afraid I must agree with Oivind. You missed the point. If I have a long stroke and a fast turn over I can still swim VERY slowly if I do not engage the water. This pounds per inch of force I can generate, and the effectiveness of engaging the water is more important than either stroke length or turn overrate. Of course all three combined will ultimately tell the story of a swimmer’s speed. Pat Thank you for your comment. The evidence shows otherwise. I certainly understand what you mean by engage the water. I believe you mean to create locomotion, not turbulence, when you apply pressure. That’s important for sure. But it’s not easily measurable, whereas stroke length is. And decades of studies have linked SL to performance more closely than any other factor. And drag reduction makes a much higher contribution to SL than does increasing propulsion.